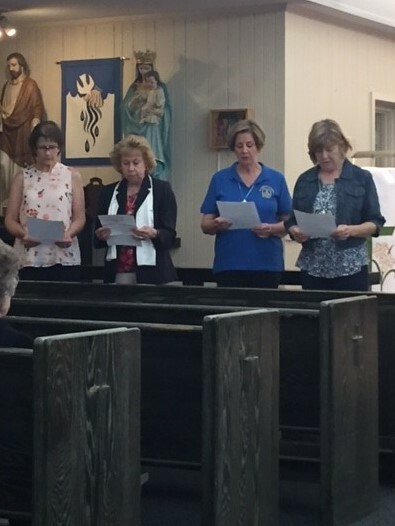 On May 27, 2017, at the monthly parish Mass for the St. Anthony’s North Beach Chapter of the Ladies of Charity, the officers were inducted for the upcoming term beginning July 1, 2017: Jean Sebold, President, Liz Driscoll, Vice President, Peggy McKelly, Secretary and Cheryl Gilmer, Treasurer. As officers of the chapter, these ladies will be overseeing the various ministries that the Ladies perform for St. Anthony’s Parish: the Food Pantry, which serves over 200 families per month, the HeartFELT program, which provides groceries for food insecure children in the local elementary school, and the Prayer Shawl ministry, which provides shawls for Parish members with long term illnesses. This month, our chapter thanks Susan Wilson, who has been the chapter president as well as the President representing Calvert County to the Archdiocese of Washington LOC Board for 4 years, and Ann Klein, who has been our Treasurer for 4 years. Both Ladies worked very hard to expand our ministries, represent us in the ADW organization, and implement best practices for LOC organizations. The Saint Anthony’s chapter of the Ladies of Charity is very active and the officers oversee many areas of coordination with the parish and establishing and reviewing many possible ministries that are provided throughout the year.